Even before the latest rumour of his death, Moses Olaiya Adejumo, had identified being constantly rumoured dead as a burden he is not willing to carry anymore having had to bear it for the past few years. As he sat across a few journalists somewhere in Lekki where the main thrust of the discussion centred on a biography of the man who took comic acting, either on stage or on screen, to the zenith, it was easy to identify him as a man in need of utmost car e.
Being one of the very first theatre practitioners whose character assumed larger than life images, Baba Sala hardly needs any introduction, except when in conversation with those younger than 20 by which time the new era of television and film had taken over. At a briefing held recently on his forthcoming biography due for presentation on December 14, the 82-year-old spoke with difficulty as one of his wives, Mrs Funmi Adejumo, who accompanied him to Lagos from his Ilesa, Osun State residence, said the octogenarian is not suffering from old age but lack of funds for medical treatment. Garbed in a white buba and sokoto with a red cap to match, he looked frail and found walking difficult and his breathing was laboured and when he did talk, it came out in gasps of strenuous efforts. “I am alive. But I’m sick. I am too weak to talk and I can’t walk. I don’t want to be confined by paralysis. I don’t want to die like this. Nigerians should please help me,” he blurted out the words, echoing a lot more than pity in every letter. 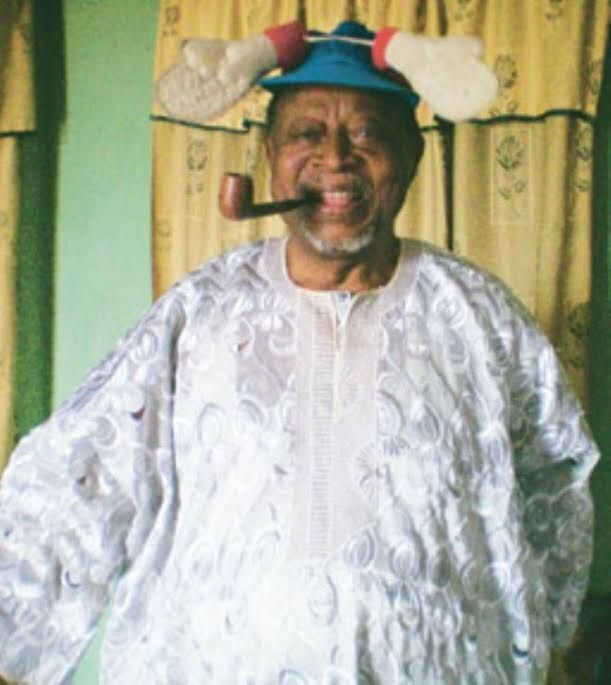 Being a pioneer on the Nigerian comedy scene, Baba Sala was the toast of millions across the southwest where the Yoruba language he used for his performances, was widely spoken from as far back as the 1960s until the 90s. As a total performer, theatre was not his only forte; he was also a good musician renowned for taking the now legendary King Sunny Ade through the basics in music. According to Collins Oyedokun, who penned the biography of Baba Sala along with Akinola Babatunde and Kunle Ajani, that Baba Sala is first among equals is a fact no one can dispute. Titled Triumph of Destiny, the foreword of which was written by a foremost academic, Professor Gbemisola Remi Adeoti of the Obafemi Awolowo University, Ile Ife, the book captures the life and times of Baba Sala for posterity as published by Sunshine Consult. “The book chronicles the pride of place that Baba Sala has in the Nigerian theatre industry as a comedian and consummate entertainer,” said Collins who said they were also moved by the actor’s health challenge in writing the book. “It captures the antecedents and essence of the creative energies of a comical trailblazer,” Oyedokun said of the book whose proceeds he and his associates hope will be more than adequate in taking care of the health and life of the ace comedian. “The book chronicles the pride of place that Baba Sala acquired for himself in the Nigerian theatre industry as the first comedian and consummate entertainer. It captures the antecedents and essence of the creative energies of a comical trailblazer,” Oyedokun added as CEO of Precision Edge Limited, Mrs. Bidemi Ojoawo Oladoye, who facilitated the media engagement, requested for the support of young musicians and theatre practitioners. “A legend doesn’t deserve to die like this. People like Davido, Wizkid, 2Face Idibia, Kunle Afolayan among others can and should help Baba Sala in any way they can,” she said. Preempting the thoughts of Nigerians who might wonder if Baba Sala did not have any investments at all, his first son, Reverend Dele Adejumo, said they have all been wrecked by circumstances and debt incurred. Going down memory lane, he said the pirating of his film, Orun Mooru, many years ago by an unscrupulous business man led to the collapse of his businesses in Ibadan and Ilesa in Oyo and Osun States. H i s son, mentioned some of Baba Sala’s investments which unfortunately, are no longer in place. “He had hotels, a recording company, a photo magazine company as well but those in charge of management wrecked it all. In those days, they invested their own money and even borrowed money to do projects but he is now left with nothing. “Among these are the Awada Spot in Ibadan, Alawada Standard Hotel in Ilesa and Alawada Records and Ibukun Alawada Photo Magazine which were also in Ibadan. He had investments but they have all been wrecked by mismanagement,” the younger Adejumo said. “He also had a three-storey building in Mushin, Lagos, which he had to sell to offset debt incurred when his work, Orun Mooru, was pirated. We still have some of his recorded works not in the public yet but machines that will be used to transform them to an acceptable format are not easily available. We do not have the kind of money they are charging us. “We have been told that baba needs a lot of money for medical treatment abroad. He is suffering from a stroke and other ailments. There are many people of his age who are not like this. We are trying our best as family members. We take him to the teaching hospital weekly but he needs proper medical attention. “It is quite unfortunate that somebody of his pedigree should be forgotten and abandoned just like that, that is why we feel he should be celebrated while alive. When Chief Obafemi Awolowo died, late Dim Emeka Odumegwu Ojukwu said he was the best president Nigeria never had. Baba is the first notable comedian in Nigeria,” Oyedokun added. Hardly able to speak when he was given time to, the theatre icon called on President Muhammadu Buhari and governors across the Nigerian federation, especially those of the south west, to make their presence felt at the launch of his biography coming up later this month, December 14, in Lagos. “We also have many of his recordings but most are not compatible with new technology except you transfer them to new formats. He used to own a six-storey building at Mushin which he had to sell in order to offset his debts from the film, Orun Mooru, after it was pirated. As the countdown to the December 14 date begins, one cannot but wonder and hope that this destiny should triumph.